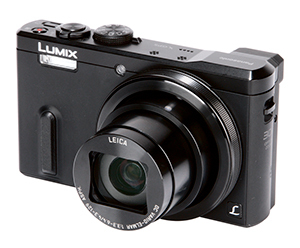 Cyber-shot DSC-HX60, which measures 108.1×63.6×38.3mm. However, the difference is minimal and both cameras fit into a trouser pocket. The body of the TZ60 is made partly from magnesium alloy and partly from polycarbonate, giving it a more premium feel than other models in the TZ series. On the front of the body is an embossed grip with a textured rubber inlay, which, combined with the raised rubberised thumb grip on the camera’s rear, gives a solid purchase. A single scroll wheel that doubles as a D-pad takes care of many of the camera’s settings and adjustments. Scrolling changes values such as shutter speed and aperture, depending on what mode the camera is in. The same adjustments can be made using a ring at the front of the lens, which also controls zooming in automatic mode. 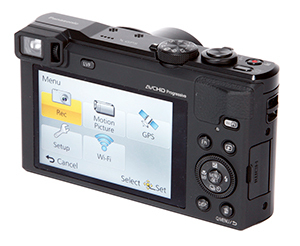 A function button allows users to create a custom shortcut to a specific camera control. Options include focus area set, quality, composition guide, histogram, focus peaking, AF/AE lock, one-shot AF, metering mode and AF mode. Also featured is a Q menu through which ISO, white balance, AF and other modes can be accessed. The battery used by the TZ60 is rated to 300 shots. However, there is no standalone battery charger included, so the camera is frustratingly out of use while the battery is charging. Spare batteries are advisable.